Former Derby County and West Ham goalkeeper Stephen Bywater has joined Burton until the end of the season, subject to international clearance. The 34-year-old returns to England after a spell in India with Kerala Blasters, managed by Peter Taylor. 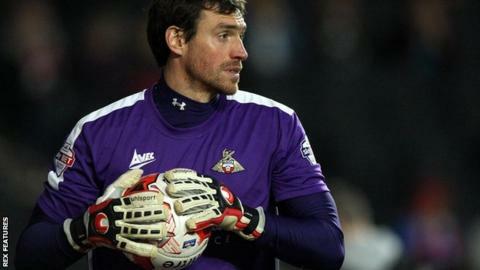 Bywater, who joins as back-up keeper for Jon McLaughlin, has spent time with 13 British clubs in his 18-year career. "I'm here to enjoy myself and be part of a squad that's hopefully going for promotion," Bywater said. "You have a team that's got a lot of clean sheets and who are top of the league. I'm here to add to that and to a squad that's hopefully going to do well." Bywater replaces Remi Matthews, who has been recalled from his loan spell by Norwich, and is reunited with former Derby manager Nigel Clough and goalkeeping coach Martin Taylor at League One leaders Burton. "Martin was the goalkeeping coach at Derby and now he's here - that was a big attraction for me," Bywater told the club website. "I wanted to join the team as I know he will do well at Burton."